Veteran actor and Producer, Augustine bids an untimely farewell, at the age of 56 years! 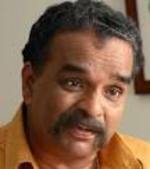 Augustine has been an unavoidable presence in Malayalam Cinema for many years. He has acted in around 250 films over the span of 35 years, Ranjith's 'Kadal kadannu vanna Mathukkutty' and Joy Mathew's 'Shutter', being his last films. He was the producer of 'Mizhi Rantilum', directed by Ranjith. Devasuram, Ravanaprabhu, Aaraam Thampuraan, Narasimham, Nandanam, Mizhi Rantilum, Indian Rupee, Sadayam, Chintaavishtayaaya Shyaamala, Katha Parayumpol, Usthaad, Arabikkatha, Commiissioner, Kadal Kadannu vanna Mathukkutty are among the major films he has done. One can't think of a 'Ranjith film' without the smiling face of Augustine, so much so that one would be looking to see his face and miss his presence in future. Who can forget 'Bappu' in 'Aaram Thampuran' who comes to Jagan, the character Mohanlal plays, with a sack-full of money for the renovation of the temple, 'Josettan' in 'Chandrotsavam', and 'Skariah Thomas', in 'Katha Parayumpol', who tries every trick to get close to the stage actor Mammootty plays!? 'Hydrose' from 'Devasuram' or 'Ali Babu' from 'Usthaad', and many other characters are equally memorable, just proving that an actor doesn't need to have the 'Super Stardom' to be remembered by the public! Though he has acted in around 250 films, and shared the screen with most of the big actors in many major films, 'Bapu from 'Aaram Thampuran' and 'Josettan' from 'Chandrotsavam', come to my mind foremost and I can't think of Mohanlal in a 'Ranjith film' without Augustine, because Augustine was always the lively presence around Mohanlal on the silver screen! Ann Augustine who made her debut in the film 'Elsamma Enna Aankutty' in the leading role, is his eldest daughter. He is survived by his wife and two daughters. Augustine's acting was such that he would always be remembered and the characters he did in his film, be it a villain, comedian or any other, would live in our hearts! Our thoughts are with his family. May his soul rest in peace!